US 511: Appeared in late 1926 as an original US Highway. US 511 only had a small part in Virginia. Shown on the main official maps 1927-29 but not Bristol insets. 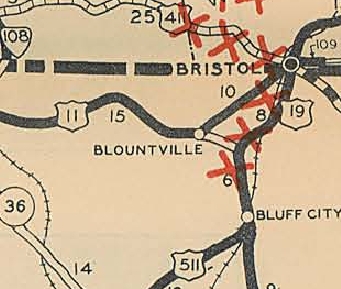 It reached Bristol via Pennsylvania Ave into Bristol, TN, then used State St west to Front St where it met US 11. Westbound State St is in Virginia. In late 1929, US 511 became US 11E.